— Julian Mack 1866–1943 1929–1930 — —  reassignment to 2nd Cir. ^ Jackson was appointed to as a circuit judge for the Sixth Circuit in 1886 by Grover Cleveland. The Judiciary Act of 1891 reassigned his seat to what is now the U.S. Court of Appeals for the Sixth Circuit. ^ Mack did not have a permanent seat on this court. Instead, he was appointed to the ill-fated United States Commerce Court in 1911 by William Howard Taft. Aside from their duties on the Commerce Court, the judges of the Commerce Court also acted as at-large appellate judges, able to be assigned by the Chief Justice of the United States to whichever circuit most needed help. Mack was assigned to the Seventh Circuit immediately prior to his assignment to the Sixth Circuit. ^ Edwards was nominated for a seat on the Sixth Circuit by President Kennedy, but he was confirmed after Kennedy's assassination and was appointed to the Sixth Circuit by (i.e., received his commission from) President Johnson. "Standard Search". Federal Law Clerk Information System. Archived from the original on October 21, 2005. Retrieved June 26, 2005. "Instructions for Judicial Directory". Website of the University of Texas Law School. Archived from the original on November 11, 2005. Retrieved July 4, 2005. 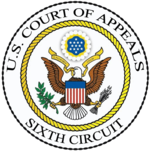 "U. S. Court of Appeals for the Sixth Circuit". Official website of the Federal Judicial Center. Archived from the original on January 1, 2005. Retrieved June 26, 2005. "Susan Bieke Neilson: She had a passion for justice". Detroit Free Press. Archived from the original on September 14, 2006. Retrieved February 7, 2006.